Our premier renovated waterfront property lies on a quiet island off Virginia’s seashore. Savor fresh seafood and admire waterfront sunsets and wild ponies. Walk from our Main Street hotel to quaint boutique shops and restaurants. Find the beach with its water sports activities and the Chincoteague National Wildlife Refuge, just two miles from our hotel. Explore family fun at the NASA Flight Facility Visitor Center, only five miles away. Start your sightseeing or work day with your complimentary continental breakfast served at our hotel daily. Relax in a comfortable king- or queen-sized bed in one of our 21 guest rooms with private balconies, featuring tranquil bay views from our balconies. 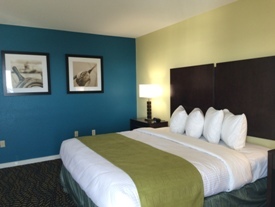 Each room is equipped with free internet access, a 42-inch HDTV, microwave and mini-refrigerator. Relax and unwind with us at the Anchor Inn!